This is a small sample of what you will see and hear around Disney World during the Holiday Season. I hope that you enjoy it as much as I do! 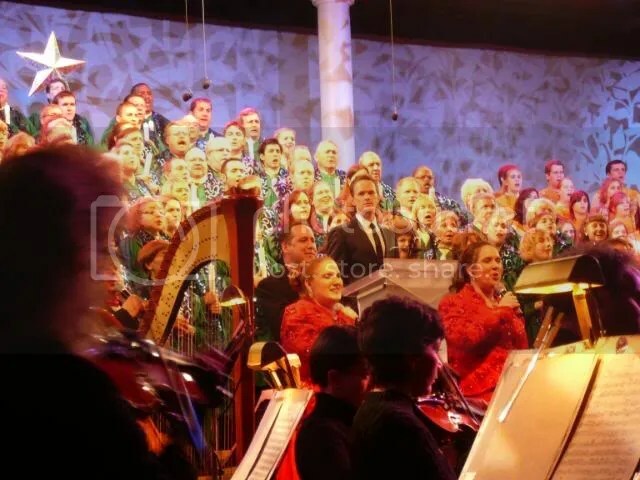 Here are some pictures from my previous Disney Holiday Vacations with some of my favorite events & decorations including the gingerbread carousel at Disney’s Beach Club, the gingerbread house at the Grand Floridian, Osborne Family Lights, Mickey’s Very Merry Christmas Party, and the Candlelight Processional with celebrity narrator Neil Patrick Harris. I booked the Candlelight Processional Package the day they came out. It took a few tries to be able to get LeCellier, but perserverence paid off. Our dinner was at 5:05 followed by the 8:15 show narrated by, wait for it…..Barney Stinson um I mean Doogie Howser, no that’s not it. 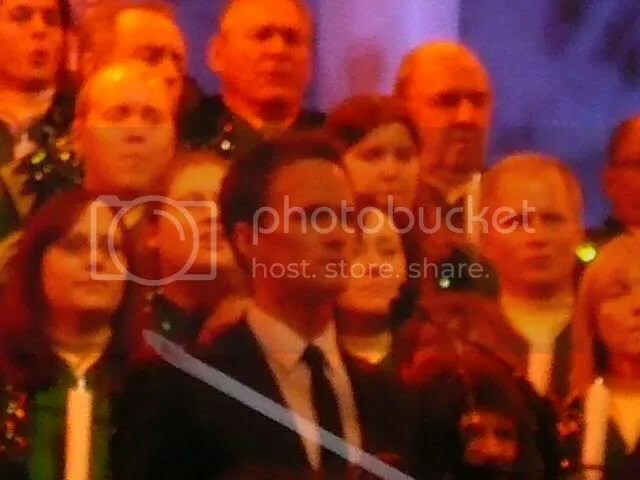 Neil Patrick Harris!!!! The kids met us a little before 5pm and we checked in for dinner. Took about 20 minutes to be seated. We were seated in Prince Edward Island, home of Anne of Green Gables and our waitress Kater. Kater explained that with the Candlelight Package we would get an appetizer, entree, dessert & non-alcoholic beverage for our set price of $53.99 and that we could use our Disney Dining Experience/Tables in Wonderland discount Last year we couldn’t and I was pretty sure I had seen that we couldn’t this year, but I’m not gonna pass up saving 20%. DD complained that she was still full from lunch at Electric Umbrella (eventually she’ll post that review ) Since I had to pay for DS as an adult, I told him to just try whatever he wanted for an appetizer since it was paid for anyways. 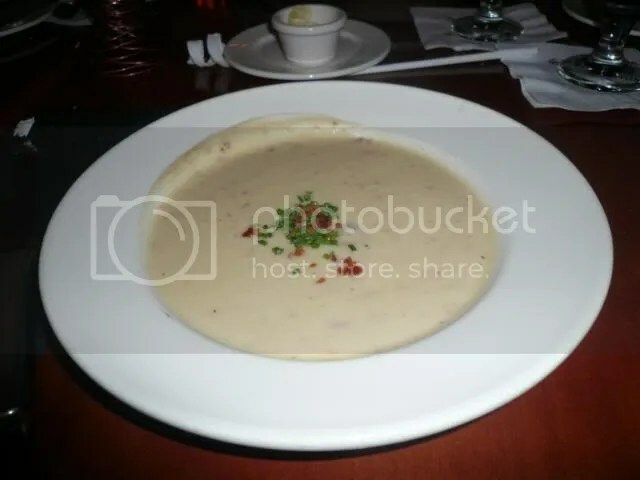 After much debate, he decided to try the Cheddar Cheese soup because he knew that everyone else loved it and he could give it to one of us if he didn’t like it. DH & DD also ordered the soup. As much as I love it, I decided that (A.) I should take advantage of the appy being included and get something a little different and (B.) I knew I’d end up with DS’s soup, so I chose the Duck Two Ways. The soup was warm & yummy. Perfect! DS was happy to learn it had bacon (he loves bacon) he tried a little bit of pretzel bread dipped in the soup and thought it was pretty good. DH enjoyed every last bit of his and DD only ate about half of her bowl, still saying she was too full and not feeling well. 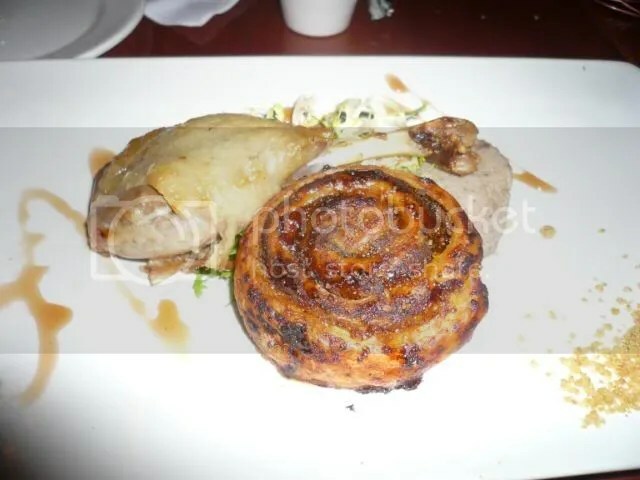 It was a warm duck leg and a cold pate served with a warm cardamom sticky bun. How was I supposed to turn down an appy that included a sticky bun?! I liked the leg, not so sure about the pate. It was better with the sticky bun. The sticky bun was really good DH finished my pate & I finished DS’s soup. Nothing was touching, the wild mushroom risotto was served in a bowl and the white truffle & herb butter sauces was served in it’s own little bowl. DS was in heaven the minute he took a bite of his filet, a perfectly cooked medium rare. After awhile he became adventurous and tried the truffle & herb butter and almost fell over at how good it was. Sorry to say that DH, DD & I all ordered the same thing. The new Coffee Rubbed Kansas City Strip. It’s only been on the menu for about 3-4 weeks. 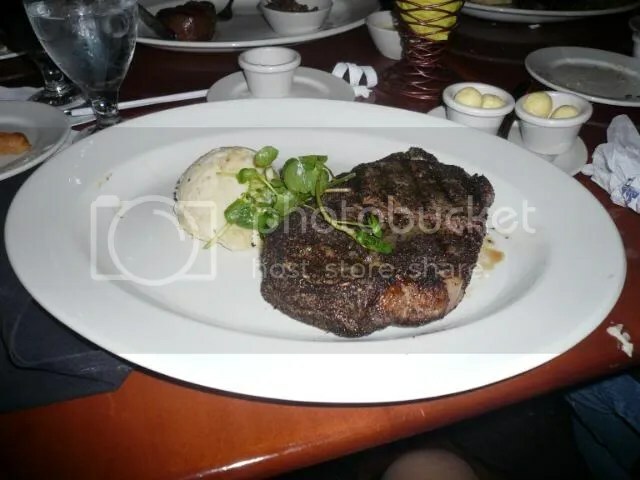 It’s a 16 ounce bone in strip with a coffee rub, served with the cream cheese mashed potatoes. I will start by saying, this was a BIG steak! It was also very good, a little peppery and definitely had a coffee flavor and did I mention it was BIG?! 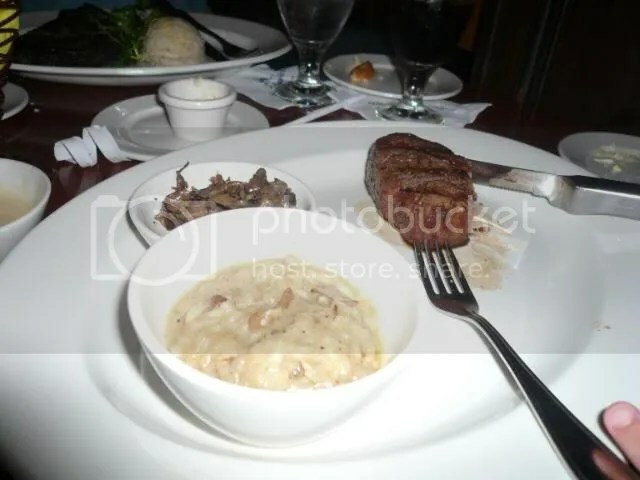 The cream cheese mashed potatoes were yummy! Smooth and cheesey! Dessert time! DH & DS both got the Maple Creme Brulee, I decided on the Chocolate Whiskey Cake and Kater asked DD which dessert she would like boxed up (very nice) DD decided the Chocolate Whiskey Cake would travel best. It arrived at the table all boxed up for her to bring back to the villa. 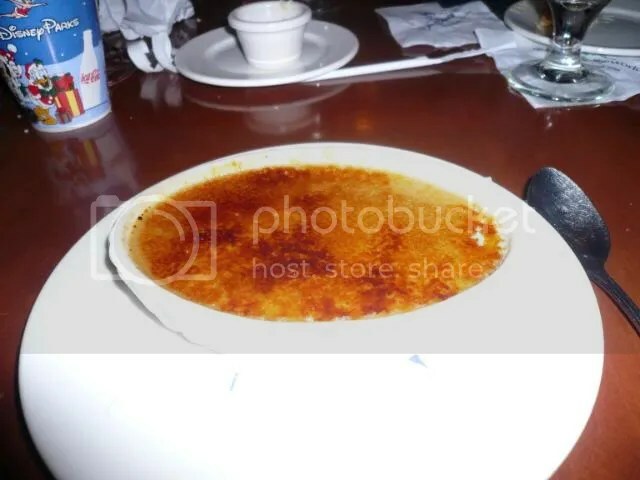 I’m not a big creme brulee fan (texture issue), BUT this one is very good. Top was perfectly crunchy and the inside was smooth and mapley. Some get too eggy/custardy/flan like but this was perfectly silky smooth. DH devoured his and DS made it half way thru before he couldn’t eat another bite. He was full, but very happy. This is chocolatey goodness! 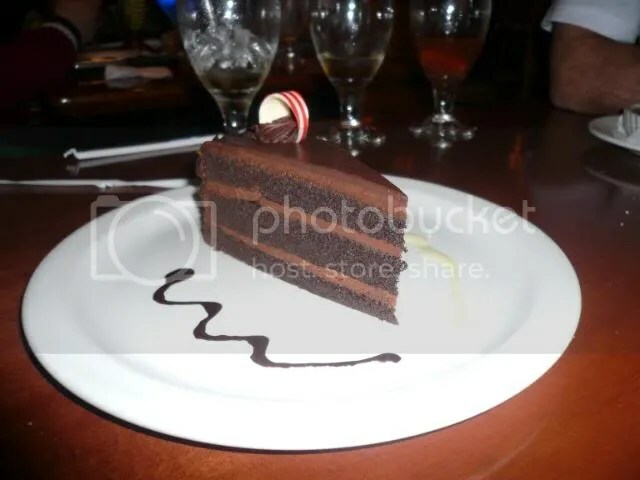 Chocolate cake with chocolate mousse brushed with whiskey, what’s not to like. The sauces on the side were a chocolate vanilla walnut sauce & a honey-thyme anglaise. Both were good and I was very surprised by the honey thyme combo, but the savory thyme worked really well with it. DH & I both had a cup of coffee with dessert (no charge for the extra drink). While enjoying our dessert, Chef Nicholas came out and made his way around the dining room. We had a chance to tell him how good our meal was and DS was able to thank him for the TV dinner!